AUSmotive.com » Jaguar F-Type coupe coming to Goodowod FoS? Jaguar F-Type coupe coming to Goodowod FoS? 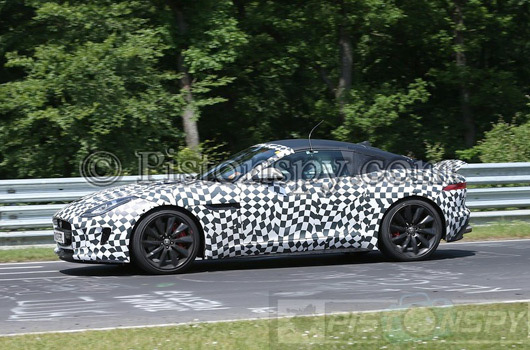 On the same day it’s officially announced “an exciting new design study based on the Jaguar F-Type convertible sports car” will debut at this weekend’s Goodwood Fesitval of Speed new spy shots of the F-Type coupe emerge. Hmm, pretty easy to put one and one together on this one, don’t you think. Check out the gallery from Pistonspy using the link below. We got a preview of what to expect back in May when drawings of the F-Type coupe were leaked. That simply confirmed that the 2011 C-X16 Hybrid concept is pretty much what the new coupe is going to look like. And that’s a very good thing. The underpinnings of the coupe will be based on the F-Type convertible, of course, and that would appear to also be a very good thing. Talk of V8s, superchargers and special editions with lots of Rs added to the model designation is always exciting, don’t you think! We look forward to bringing you more from Jaguar over the coming week.